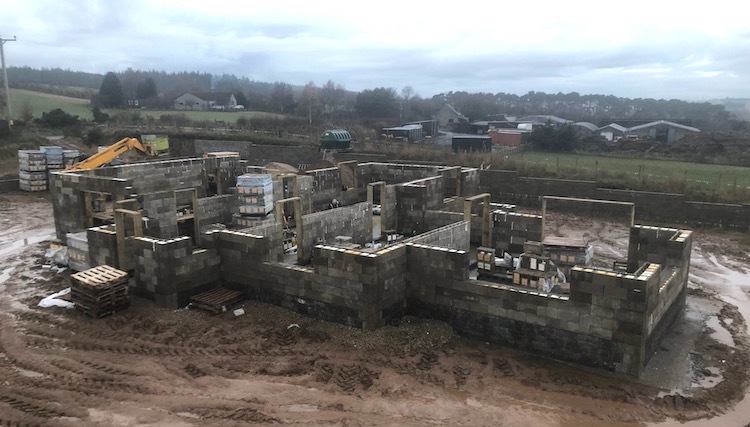 Instead of putting his feet up and relaxing over the Christmas break Durisol’s Managing Director, Derek Atkins spent the festive period labouring on-site at a new build project in Elgin, Scotland. Derek decided to roll up his sleeves and spend his holiday helping out a friend with the construction of his 190m2, 1.5 story house being built with Durisol ICF. As well as physically helping to lay the ICF units, Derek also trained the other builders who were all new to Durisol. The build continued throughout December and early January despite temperatures as low as -4 and never reaching above 2 degrees centigrade. One of the key advantages of Durisol is that you can continue to build with it in all weathers. While freezing temperatures and heavy rain will cause traditional construction to grind to a halt, this is not the case with Durisol ICF. This benefit makes it an ideal construction method for building projects in Scotland and the north of England. It took just 10 days, with a maximum of four builders on site at any one time, to build up above lintel height across the entire ground floor. Derek has now returned to work, so the build is having to continue without him, but the system is so easy to use that the project will continue apace. The project is on track for quick completion following a great start. Even the heavy snow currently falling in the north of Scotland isn’t interrupting progress! If you’d like to find out how easy it is to build with Durisol, please give us a call on 01495 249400 or come along to one of our free training days.